Dancing With The Stars Juniors Photos, News, and Videos | Just Jared Jr.
Sky Brown and JT Church were crowned the first ever champs of Dancing With The Stars Juniors last night and the two reacted in the best way – by crying in happiness! The pint-sized team, who were mentored by Alan Bersten, took home the cool new Juniors trophy – a star. See all the pics from the finale below! 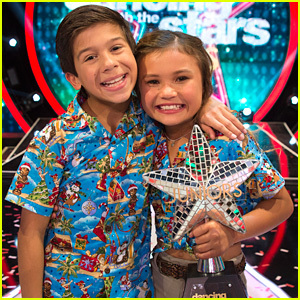 Sky Brown and partner JT Church are giving Christmas a tropical feel with their fun performance on Dancing With The Stars Juniors Finale! Airing tonight (December 9), the talented team mentored Alan Bersten, performed a cute island freestyle, set to “Underneath the Tree” by Kelly Clarkson. Earlier, the two repeated their fave dance from the season – a Salsa set to “Light it Up” by Major Lazar featuring Nyla & Fuse ODG – this time with Alan! Sky and JT picked up 60 points out of 60 for the night. A PERFECT SCORE! Remember, you can’t vote from home as the show was pretaped, but def spread your love for the team on social media using hashtag #TeamAlan! Miles Brown and Rylee Arnold get lifted up by the holiday spirit with their freestyle on Dancing With The Stars Juniors finale, airing Sunday (December 9). Mentored by Rylee‘s older sister, Lindsay Arnold, the duo performed to “Sleigh Ride” by District 78 – and even arrived on a sleigh! Earlier in the night, Miles and Rylee performed with Lindsay, repeating their debut dance on the show, a salsa to “Who Let the Dogs Out” by Baha Men. Miles and Rylee picked up 58 points out of 60 for the night. Remember, you can’t vote from home as the show was pretaped, but def spread your love for the team on social media using hashtag #TeamLindsay! SPOILERS AHEAD! DO NOT CONTINUE READING if you don’t want to know WHO WON! After ten weeks of performances, it was down to four couples who could win the first ever season of Dancing With The Stars Juniors. Ariana Greenblatt, Miles Brown, Mackenzie Ziegler or Sky Brown all put on fantastic performances with their partners and mentors – but only one could win. JJJ held a pre-poll and a lot of you voted for Sky. But did she take home the trophy?